Services on Friday for Spanish Fork native. 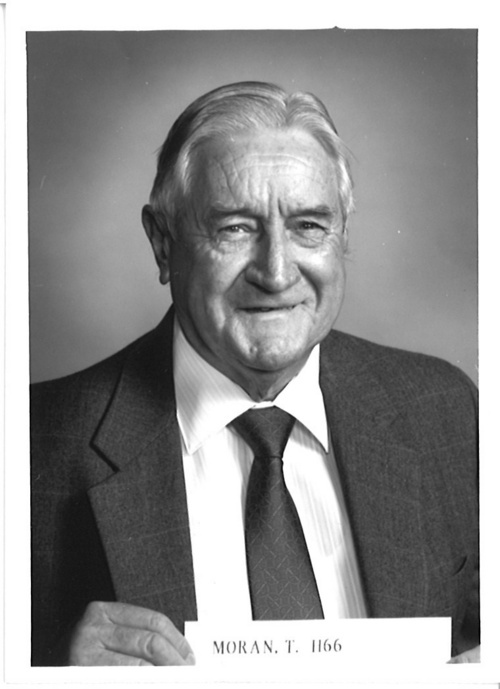 Courtesy Utah House of Representatives Tim Moran, D-Spanish Fork, represented House District 66 from 1985 to 1997. Twenty years after earning distinction as the last Democrat elected from Utah County, Tim Moran died Friday at age 95. The Spanish Fork native served in the Utah House for 12 years until 1996, when he retired and the seat was won by Republican Glenn Way. Moran and his Senate counterpart, Eldon Money, were the last two Democrats serving from Utah County  both from Spanish Fork. Moran won his final two-year term in 1994, while Money won his final four-year term in 1992. Before his election to the House, Moran served four years on the Spanish Fork City Council and 12 years as mayor. He was a professional educator, ending a 35-year career as principal of Brockbank Elementary School. Services are set for Friday at 11 a.m. at the Spanish Fork LDS 12th Ward Chapel, 310 E. Center St.
Utah County Democratic Chairman Josh Hogan acknowledges that a generation after Moran&apos;s defeat, it may yet be awhile before the next Democrat wins election in the biggest GOP bastion in a Republican state. "It&apos;s going to be a long battle," Hogan says. "You need to change a lot of hearts and minds." Hogan says the largest challenge is convincing people "We&apos;re not who you think we are." His message is simple: "Our focus is to improve education, support livable wages and demand government transparency, and it certainly wouldn&apos;t hurt to do that in more breathable air." Hogan praises the quality of candidates running on the Democratic ticket this year, including Zach Lewis, who is running for the House District 66 seat once held by Moran, but now occupied by Rep. Mike McKell, R-Spanish Fork. "He&apos;s a promising young man just graduating from BYU law school," Hogan says of Lewis. The party leader concedes he wishes he had a candidate in the Utah County Commission Seat A race where newcomer Greg Graves defeated incumbent Gary Anderson to claim the Republican nomination earlier this month. Graves has a troubled financial history of bankruptcies and a misdemeanor theft conviction but appears to have a clear road to elected office with no Democratic or third-party challengers in the race. "Well, we&apos;re kicking ourselves because we&apos;re a super-minority, and we don&apos;t have anyone to run against him," Hogan says. "When I recruit candidates, I don&apos;t try to give them any illusions. It&apos;s David and Goliath, and I don&apos;t even know if we&apos;re David." Hogan says he has talked to some people about trying to put a write-in candidate on the ballot but acknowledges that would make prospects even tougher. Casey Voeks, chairman of the Utah County Republican Party, believes the danger of Democratic gains in his area are minimal in the foreseeable future. On the other hand, Voeks warns that complacency is a form of political suicide. "Any time you think [you&apos;re invincible], things seem to change." If GOP officials begin to deviate from the popular will and party principles, Voeks says, "They&apos;ll fire us. Any party that thinks they&apos;re above that is crazy."